Softwood lumber industry players continued wondering last week where the market was, as many prices softened further and the usual spring buying spree has yet not materialized. Sales volumes were OK, according to both sawmills and secondary suppliers, but — once again — no one was stocking inventory. This makes lumber producers wary; if some large-volume buying doesn’t happen soon, prices will not strengthen before summer. As it stands now, suppliers are satisfied with weekly sales but not encouraged for the next few weeks. * Madison’s Lumber Prices, weekly, are a good forecast indicator of U.S. home builder’s current lumber buying activity. Last week was held the annual BC Council of Forest Industries (COFI) conference in Vancouver, B.C., to a jam-packed crowd and two full days of excellent presentations. Madison’s will be doing several write-ups on new information made available at the COFI conference, including: latest update of BC timber loss to 2018 wildfires, new funding announcements from both B.C. and federal governments, new construction codes for tall-wood (mass-timber) and multi-storey wood buildings, and the latest technology for forest data gathering and analysis. Check our website over this week and next for all this and more. In week ending April 9, 2019, Western Spruce-Pine-Fir KD 2×4 #2&Btr (RL) FOB sawmill wholesaler prices averaged US$366 mfbm, a decrease of -$12, or -3.2%, from the previous week. Last week’s price is -$36, or -9%, less than it was one month ago. Compared to one year ago, prices are down -$180, or -33%. Most traders felt the market was on the verge of a spring breakout. Sales activity continued to improve day-to-day for purveyors of WSPF lumber in the United States, but players still felt there was a pent-up wave of spring demand waiting to be unleashed. 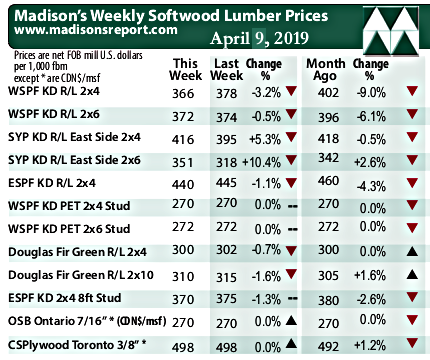 Producers nudged many of their asking prices down a bit more to keep wood moving, with sawmill order files ranging anywhere from next week into mid-April. Both primary and secondary suppliers worked hard to clear out their relatively-full inventories, an easier task recently thanks to improving rail service. In Canada, softwood lumber production volumes were being sold with consistency, which was enough to constitute an “improvement” over the previous week. Demand, however, was “spotty” from all sources.